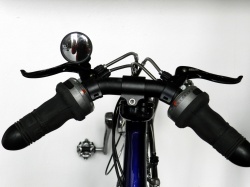 Mirrors on a bike can be very practical but are easy to bend, get loose or vibrate while riding. M5 came with a solution that fades out all these characteristics. We minimised this allready compact mirror even more and just have a look: It's there and it's still functioning! Rotatable in all directions through ball joint. 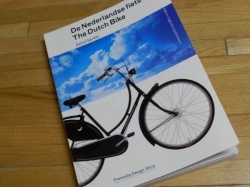 Out now: new bilingual book: "De Nederlandse fiets/ The Dutch Bike" written by Zahid Sardar. Renowned design critic Zahid Sardar from San Francisco describes the history of the iconic Dutch bicycle. Ranging from the typical Dutch black city bike up to the newest designer bikes and obviously recumbents too! The book takes off where the Dutch bicycle history begins: around 1866. It shows a great overview of the various bicycle models, bike pictures, special components, etc and ends up with the thriving contemporary expressions of a variety of Dutch bike designs. M5 is well represented with a photo page and a page-sized interview with M5 founder/owner Bram Moens. Publisher: nai010 from Rotterdam, Netherlands. ISBN is 97-8946-208-020-1. The book (� 18,90 for non EU and � 19.95 for EU ) is available through M5. First drawings of Carbon/Kevlar Triple Case For two of M5's most successful bike types a carbon/kevlar set of luggage cases will be available in spring 2013. The production molds will be manufactured soon. This new set of cases can be utilised by commuters and holiday cyclists. The watertight and aerodynamically shaped set will consist of a top, left and right case, with a combined volume of about 80 litres. By designing the cases as closely fit as possible around the frame and the rear wheel, a lot of luggage space is created, while minimising the overall width. This unique set will be available in spring 2013. Interested? Let us know by e-mail! M5 has been interviewed last november 2011 by IEEE. The reults can be read and heard on their site. To explore what's fastest on earth we've roamed the globe to check out speedy things on wheels, tracks, legs or wings, and in the water. We visited England to see a supersonic car, South Korea for the world's fastest elevator, Shanghai for a magnetically levitated train, Florida for the swiftest helicopter, M5 in the Netherlands for a record-setting bike, France's Brittany coast for a winged boat that sails faster than the wind, and more. Riding M5 recumbents to the North Cape: today and twenty years ago. Every now and then we browse through our archives, which have become rather extensive over the years and stumble upon thing of interest. For instance, we found a beautiful, old card from one of our clients, from times when computers were all but mainstream. Even then, in 1993, already large trips were undertaken to destinations like the North Cape, carrying 40 kilograms of luggage and covering daily distances of 150 km. Delightful to see the difference in reporting such a trip in 1993 and in 2012. Our current North Cape specialist Arthur van der Lee from Heinenoord (Netherlands) departs tomorrow for his third trip to the far north. Using his updated M5 Low Racer (26 inch/28 inch wheels) via Helsinki to the North Cape and back over Narvik, Abisko and Kiruna to Gotheborg. While Wout Stoffel sent handmade cards, Arthur will report by image and word on his blog, being the professional IT-er he is. A lot has changes in twenty years time. What didn't change are the wonderful landscapes up there and the personal experience of riding through them in permanent daylight. Thanks to modern media, it's nowadays possible to follow all this at a distance. 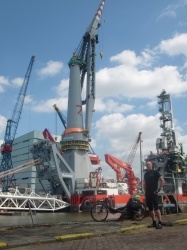 Picture 1: Arthur van der Lee ready to depart in the port of Rotterdam. Picture 2: Front side of card with route from Wout Stoffel in 1993. Picture 3: Short report at the back of Wout Stoffels card. Superior new world record of 56.597 km!! Almost everybody, except the real insiders, considered it to be impossible: breaking the super hour record by professional racer Chris Boardman. He had a remarkable stretched and low seating position which almost nobody but himself could maintain. Combined with an enormous power output this resulted in massive speeds. Since recumbent racing is performed and records set with ever decreasing seat angles, especially on the standard M5 Carbon High Racers (like Niels van der Wal, Gertjan Wijers and of course Aurelien Bonneteau), we were convinced: at some point the last racing bike record has to give way, even if the challenger doesn't even have an amateur status. 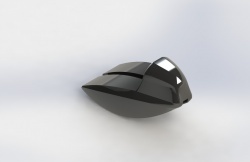 Increasingly more reclined models emerged, like the one launched by Bram Moens in October 2011. Approaching a more and more horizontal seating position required a real shoulder support to prevent sliding backwards while pushing the pedals. At the same time this new feature provided an increase in efficiency. 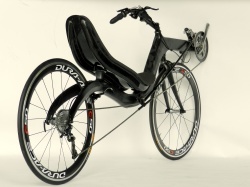 Result is a bike that reaches speeds well beyond 50 km/h, without the use of an aerodynamic tailfairing. 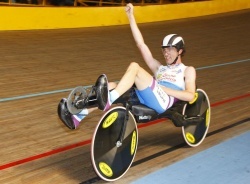 Aurelien delivered "just" 365 Watt during his 57 km hour record. With the power input of a professional racer a bike like this can easily be ridden above 60 km/h. Not in a sprint, but if necessary for hours. Lets return to the big winner Aurelien Bonneteau. When he improved the then standing world record three years ago, it was clear that we would hear more from him. M5 supported him already with the bike itself and with aero accessories like disk wheels. Subsequently several world records followed on the by M5 sponsored fully standard M5 Carbon Low Racer. Aurelien told about the run-up to the record that he started in December 2011 with training. He covered about 8000 km, of which a considerable part on the track in Bordeaux itself. Almost all training kilometres were done on his M5 Carbon High Racer. During this time he gradually worked towards the use of shorter cranks of 130 mm, for aerodynamic reasons. This necessitated high pedalling frequencies (up to 130 rpm). At the moment still a discussion takes place among a very small group of astonished American purists led by Sean Costin about the use of Aureliens convex soled shoes. Aurelien told me he needed those to be able to achieve a better balans immediately after dismounting his recumbent. By the way, these models are sold for years already at the better equiped shoestores and are meant for daily use. Interesting to note is that this was Aurelien's first record attempt, by which we want to say that the developments are far from over. The sound barrier is closer than ever! 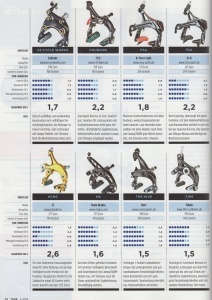 In a simultaneous test of a total of eight different brakesets in the higher price range, the M5 brakeset came out as one of the best. Especially when looking to price/quality. Particularly the enormous brakingforce and the flawless finish were mentioned. Download de test or click on the picture. Always a decent businesscard within reach! Soon available in three complete different "languages": M5 shirts with very remarkable logo's. The first one tries to meet the demands of the irresistible digital appetite of the smartphone users through the QR logo. The second one shows M5 in braille with the standard M5 logo on the reverse side. These unique shirts are available in different sizes and colors and works with a hidden zipper which runs towards the two front pockets. If you are interested in these items then inform us with sizing and color so we can ship them as soon as they are finished.